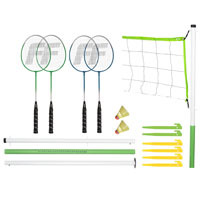 Enjoy hours of active and competitive entertainment with this great badminton set. This set includes an official-size net with 1-1/2" telescopic aluminum poles, 3/16" guy line set, and four 10" ground stakes. Not only that, but this set has everything you need to get the game going with four steel racquets, and three A-grade shuttlecocks. The durable equipment bag completes the Pro Set. Official size net. 1 in. top tape, 4 in. side sleeves. 8 in. Yellow boundry pre measured, high visibility. Keep your eye on the birdie! 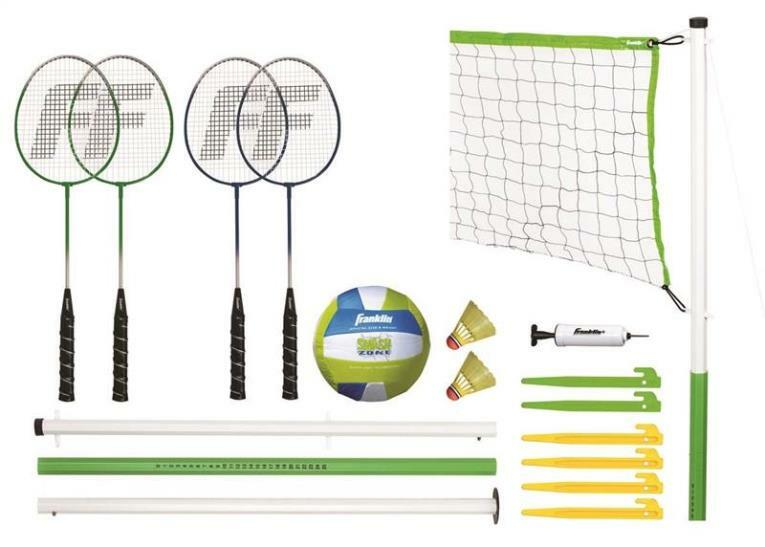 The Badminton Sport set from Park & Sun Sports has everything you need to get started. Durable 3 pc. steel poles, regulation size net, 4 racquets, 3 shuttlecocks and a full size carrying bag. 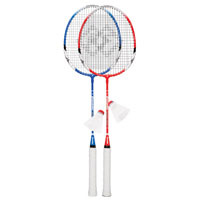 Quick and easy set-up and great for a recreational game of badminton. Badminton's roots reach all the way back to 1800s British India in a small garrison town called Pune. These days, you can unzip the nylon carrying case to our Complete 4-Player Badminton set and transform just about any patch of grass into a court! 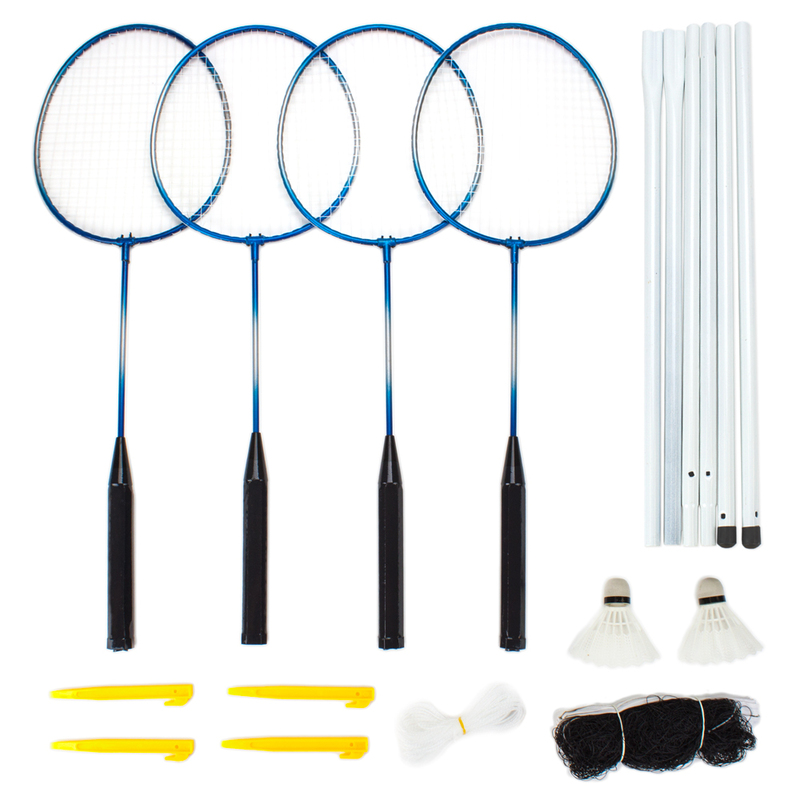 Including four steel racquets with tight nylon strings and two shuttlecocks, this set also features an easy-to-assemble temporary net. Standing 5 feet tall and extending up to 20 feet, this net doesn't need any tools or fasteners. The poles simply slide together and are anchored to the ground with strings and stakes, so both set-up and clean-up are quick and effortless. Why You'll Love It: We've got all the equipment covered; you just need to bring three friends. The set-up is fast and simple, and the racquets are tough and lightweight steel with tight, hardy nylon strings. Pack the whole set up in the included nylon cloth carry case, and take it wherever you like!